take some photos in the rain. This song...White Daisy Passing on my mind. Beautiful harmonies, haunting lyrics and scenes of Seattle in the video. Thanks so much for the photos of the rain. I only wish we would get a little here. Still hot as Heck here. Beautiful and peaceful pictures!!! Thank for sharing them. Have a great weekend too! Acabo de encontrar tu blog, hermosas imágenes de la lluvia!feliz fin de semana!!! aahhhhh....rain! are you lovin it? please, send some my way, it is hot and DRY here! love them cute boots! I love taking photos in the rain...yours are beautiful, Becca! So lovely there! So glad you are finding positivity and beauty amongst our (wretched) weather. I know it's better than the dry heat most of the country has but we'd really like SOME sun! I love your rain shots, you can almost feel the humidity there too and love your music! Love how you have captured the emotion of rain - the feeling of rain on objects - the way it reflects the light, the mood it creates. 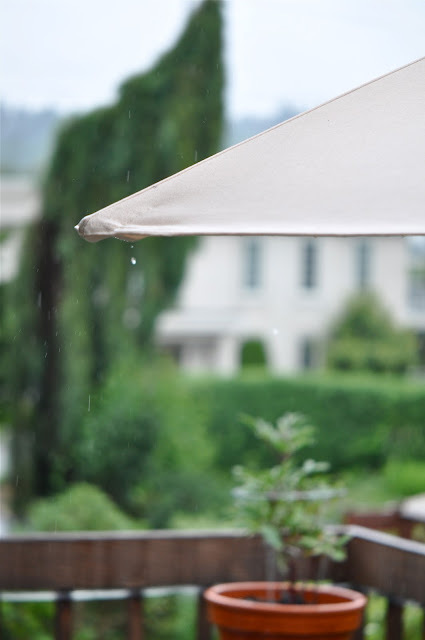 It's a cold winter rainy day here in the Kwa Zulu Natal Midlands and it's just perfect! Great rain shots!! I love the drop off the umbrella - and those shoes. Happy rainy Saturday. I am thinking all this rain is like a new adventure in photography for you Becca. Beautiful captures! lovely.....could you send some of that rain our way, too??? Dearest Becca, the world just seems so pretty and perfect when I look at your photographs. The shoes are amazing. Love that Kokopelli stepping stone! Great photos; I had to smile at the sun with the rain dripping off it ~ only in Seattle. We experienced some amazing rain in MN last week. it may be rainy but it's so beautiful in the NW. looks like you are finding your way around seattle. What a change from Vegas!! I see you have already put your "touch" on your home -- gardening and decorating. Your kitties are adorable.